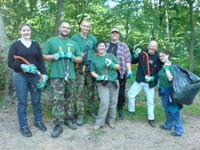 "Fourteen managers from MWH, an international company connected to the water industry with offices throughout Britain, volunteered at Wybunbury Moss National Nature Reserve (NNR) as part of MWH Mersey Basin Week. They cut down small trees and scrub that has invaded a flower-rich meadow purchased by Natural England last year. 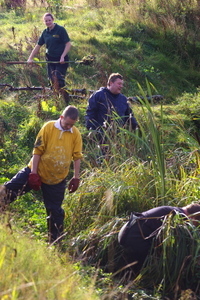 The meadow forms part of the Site of Special Scientific Interest at Wybunbury Moss which was, owing to years of neglect by its previous owner, in poor condition. The work carried out is a vital contribution towards improving the condition of the meadow and enabling the plant community present there to survive. 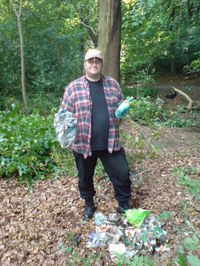 The MWH managers, staff from the Mersey Basin Campaign and their Natural England staff supervisors worked hard and have cleared about a third of the scrub on the meadow. 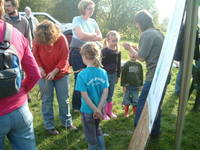 Sarah Warrener,Natural England's site manager at Wybunbury Moss, explained that there are several different habitats at Wybunbury Moss NNR. If the trees and scrub remain untouched the bog, fen and meadow plants would be lost and the site would become a woodland. This would also have a negative affect on the rare and unusual insects and other invertebrates that currently live on the site, for example the rare beetle Cryptocephalus decemmaculatus, that is found only at Wybunbury Moss and one other site in Britain." 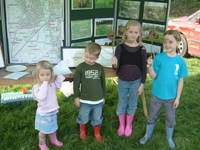 RSPB held their annual Estuary under the Microscope event at the Ribble Discovery Centre last Sunday. Over 300 visitors examined tiny creatures barely visible to the human eye through Chantelle Edwards' microscope. The larger than life images were displayed on a TV screen for all to see. 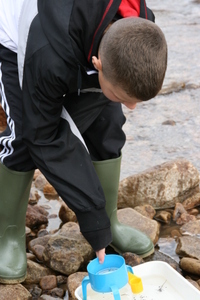 This event has become a much loved tradition of MWH Mersey Basin Week at the Discovery Centre and illustrates the importance of the estuary mud as a giant foodstore for the millions of birds that populate the estuary. 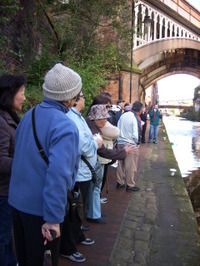 As part of Mersey Basin Week 2008, October 9th saw the start of the 3rd annual Manchester Oriental Organisations Alliance (MOOA) Canal Walk. The weather was beautiful and we had a great turnout, with 20 Chinese Elders attending. 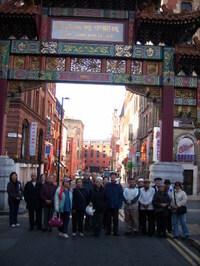 We all met at the Chinese Arch in the city centre and after a quick health and safety talk by Sarah Flynn and a few photos (with the addition of a local policeman! ), we set off towards Canal Street. 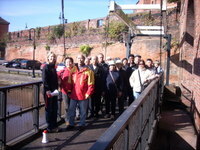 Beside the canal, Freya Cheshire gave a brief talk on the Rochdale Canal’s history, helpfully translated by Kin Cheng. We then set off along the towpath stopping at key points for Freya to give information about Manchester’s history and the significance of the canal in shaping it into the world’s first modern city. Most of the information used in the talks was taken from the recently launched Hear Manchester website (www.hearmanchester.com) which contains 10 audio files designed to be downloaded and listened to whilst walking alongside the canal. The audio files include interviews with local experts and cover different aspects of Manchester’s fascinating and varied history. As the sun shone, we came to Dukes’ 92 in Castlefield where we were lucky enough to see a canal boat being transported through the lock. Everyone stood and watched as the boat entered the Bridgewater Canal and everyone seemed to enjoy seeing the locks working. After a brief rest, we took a slight detour around the Grocers Warehouse arm of the Bridgewater Canal and then rejoined the Rochdale to make our way back towards Oxford Road. After the walk, we had all worked up an appetite so we walked to Tai Wu on Oxford Road and sat down to the most delicious Chinese meal containing lots of traditional dim sum dishes. It was a brilliant end to a thoroughly successful walk. We would like to say a huge thank you to Bev Mitchell for helping to organise the walk and to Kin for acting as our translator, and thank you to all the Elders who attended, it made it really enjoyable.